Mr. Thirsty The Original Water Eater, which can be used in any area that has condensation, water leakage, dampness or mildew, is made of super absorbent and compounds which absorb and lock in more than ten pounds of liquid. After it's been absorbed, the liquid can’t be pressed out and it won’t leak out. Basement leaks? Washer overflows? Patio door leaks? Puddles around sliding doors? 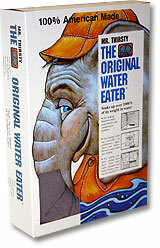 Introducing Mr. Thirsty The Original Water Eater. No home should be without one.